IDEA cellular India’s the fastest growing Pan India GSM mobile service operator has come up with an innovative movement and today introduces ground braking lowest mobile tariff for its prepaid subscribers in West Bengal including Kolkata Metro. 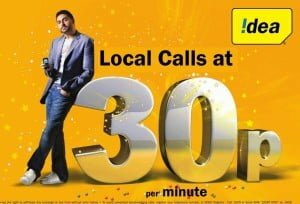 IDEA which the latest entrant in Kolkata and West Bengal wireless market launches new Recharge-31 wherein existing Prepaid subscribers can enjoy all local calls to any network with in Kolkata/West Bengal circle just at 30 paisa. The RC-31 comes at Rs.31 with the validity of 30 days. The new IDEA prepaid subscriber can avail the same benefits with FRC-61. Dhus! MTS is way better for 30p/min or 1p/2sec tariff. When IDEA is goin to launch this tarrif in UP East.?????????????? ?